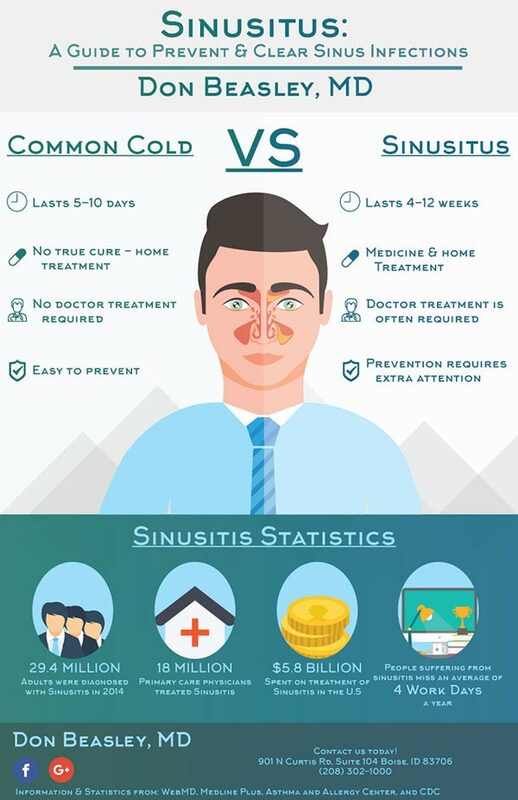 Sinusitis, commonly referred to as a sinus infection, is an inflammation or swelling of the tissues that line the sinuses. When the sinuses get blocked and filled with fluid, germs may grow and this can result in an infection. Sinusitis is a very common affliction. Acute sinusitis occurs when you have two or more of these symptoms. If you have thick, green, or yellow nasal discharge, then it is most likely acute sinusitis. For a simple sinus infection, the doctor may want you to take a decongestant and use saline nasal washes. However, you should make sure that you don't take over-the-counter decongestants for more than three days. The doctor may want to put you on a series of antibiotics. This will probably last for 10 to 14 days. The symptoms that you have will probably abate with this treatment. You can use warm, moist air for chronic sinusitis. You can get this from a vaporizer, or you can inhale the steam from a pot of hot water. Be careful not to burn yourself with the steam. Your doctor may also give you steroids along with the antibiotics that they prescribe. If you are suffering from allergies, the doctor may give you an antihistamine. If you have a fungus, the doctor may prescribe an antifungal medication. For immune deficiencies, the doctor may give you immunoglobulin. In certain extreme cases, your doctor might recommend sinus surgery. This will be the case if the structure of your sinuses is improper. Nasal polyps may also be blocking your sinuses. They will need to be removed. Sinusitis can be a painful and debilitating condition. However, except in unusual cases, the affliction can be easily treated by your doctor.